So, we begin our journey through 50 different cheeses with one of my favourites. Not exactly a risky choice I know, but we have to start somewhere. Now, I’ve devised three tasty tests, all of which involve me eating lots of cheese. Fantastic. This is the basic taste test. 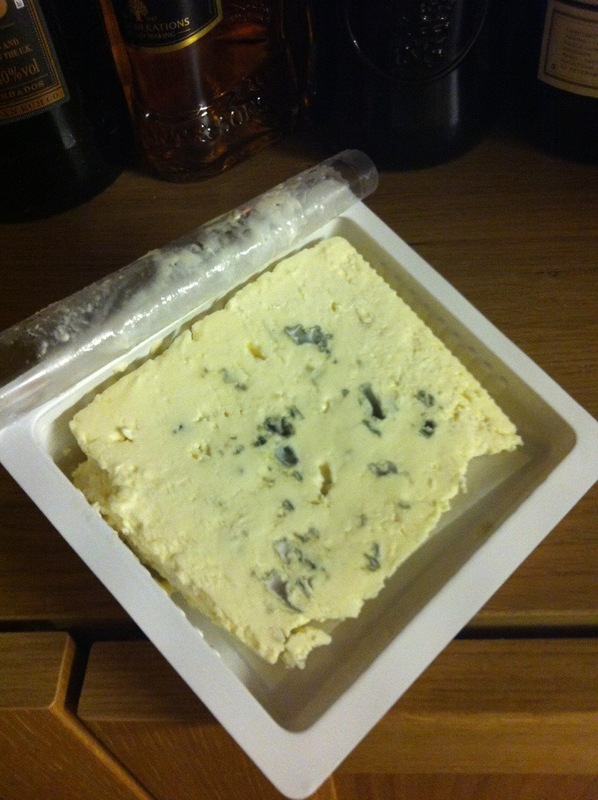 Saint Agur is a creamy, wet blue cheese. Plenty of salt, plenty of tang. I don’t really know how else to describe it. It’s rich, certainly, but I think the main benefit of Saint Agur is its versatility. On its own it lacks something, so let’s try it with other things. 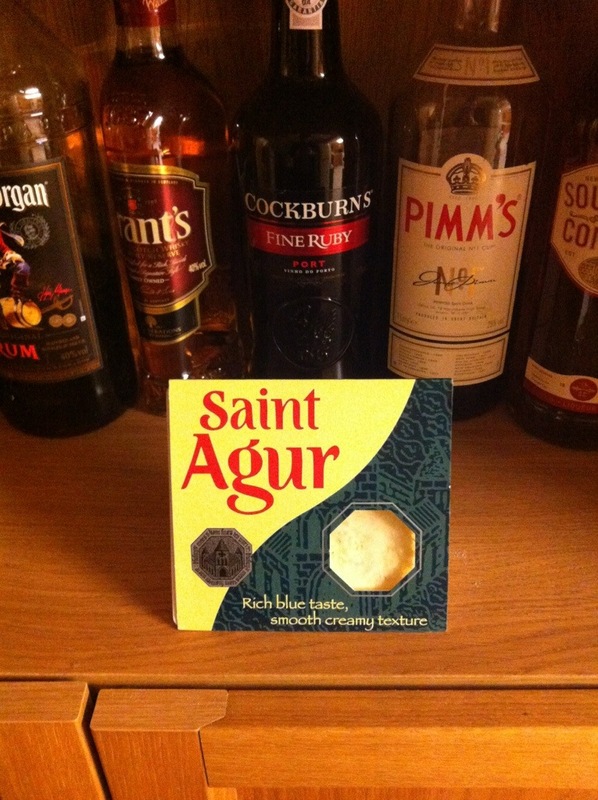 How does Saint Agur fare on a biscuit? Well, I tried it on a water biscuit, which as we all know has no taste, thus making it perfect for this challenge. You know what? I liked it on this biscuit. I wouldn’t marry this combination, but I would certainly eye it up across a crowded bar mulling over what my mother would think if I brought it home to dinner. I think they’d get on well, but I’m in a semi-serious relationship with a volatile Pont L’eveque on a Hovis biscuit and I don’t want to ruin anything. It’s that kind of cheese. For me, a key measure of cheese versatility is if you can cook with it. What does it bring to the table in terms of flavour and texture that you might not get anywhere else? For that reason I have devised the Breast Test (and yes, I did snigger when I came up with the title). How well does Saint Agur stand up to being stuffed inside a chicken breast wrapped in bacon? The answer: very well indeed. I probably overstuffed the breast, but that meant I had plenty of overspilling cheese to drizzle on top. 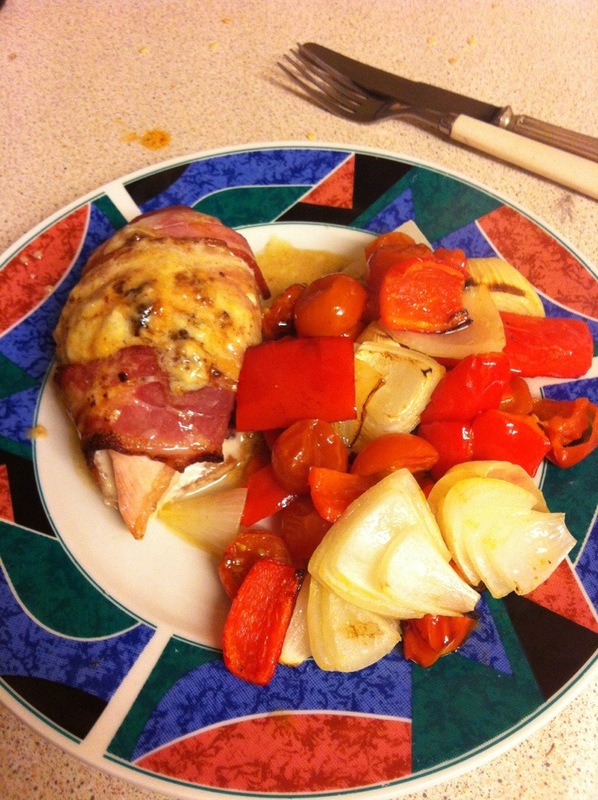 The flavour perfectly complemented the smoked bacon (thick cut Tesco’s Finest) and every bit was a joy. On the back of the packet there was a recipe for a Saint Agur quiche, and on the basis of how well it cooked in the chicken I’m definitely going to give it a go. The cheese basically melted into the perfect sauce- not too runny, still creamy and it kept its flavour, which you sometimes lose when melting in my experience. How to conclude… This was not exactly a fair test as I knew I already liked Saint Agur, but it’s versatility and potential still surprised me. I’m going to try the quiche, I know from a previous blupdate that it’s very nice melted on ciabatta, and that’s it. A very pleasant blue. I never would have thought of cooking with it – I bet it would go nicely with some potatoes in an oven bake, what do you think? Ooh yes, or a very nice twist in potato cake! I’m a big fan of Saint Agur, great start to the cheese theme! ooooh – new blog layout. i like!